The stupidity of the clerics ruling Iran has no end. 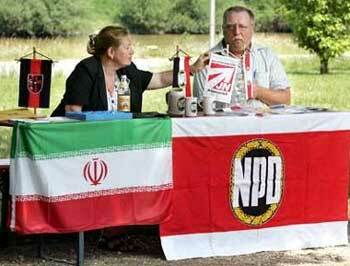 This picture from the Spiegel Magazine shows the German Neo-Nazis (NPD) with their souvenior Islamic Republic flag. NPD praise Ahmadi-Nejad as a pro-Hitler, anti-semitic and anti-Communist champion. What will the mullahs do next to justify an attack on Iran? How will the Islamic Republic apologists explain this? Oh yes I forgot, the Islamic Republic apologists will say the alliance of NPD and Islamic Republic is anti-imperialist! I think your political analysis is funny and perhaps inclined a little towards stupidity. No doubt Ahmadi-nejad is a kind of Hitler, but your logic is not better than his. can you tell me what my analysis was? BNP uses the British flag. Is that a reflection on the British government? BNP uses the British flag, it is a British party advocating British superamacy. If it used another flag other than the British flag, say the Israeli flag! 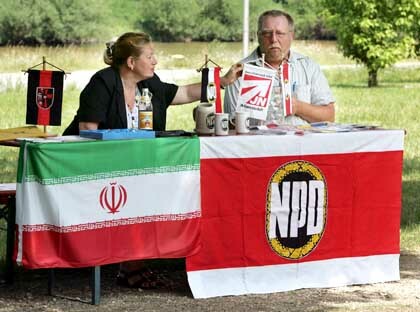 I am sure you would raise an eyebrow - if you have one - while it would make sense for the NPD to use the German flag, it is very questionable why it would use the Islamic Republic flag. Also the NPD members have been invited to Iran for ssome conferences. So you see my simple anonymous friend, its not as simple as the example you so desperately tried to pull out of the hat! I think your anlysis is absolutely correct. I can verify this from what I experienced in my stays in berlin.